Sardonyx carries the general qualities of chalcedony, together with the individual properties of sard and onyx. In modern symbolism, sardonyx is believed to bestow courage on its owner and bring balance and happiness into marriage and relationships, so it is often given as a wedding gift. If sardonyx is black and red-brown, it represents neutrality. This colour combination is also the most protective of colours, and is very grounding, as well as being more calming and soothing than the white and red-brown variety. If the colour is white and red-brown, it symbolises purity. This version holds connection with the Crown Chakra and spirit, and seems to link into posture, so one is more “upright’ when using or wearing it. When all three of the colours are present, especially if they are equally dispersed, it is symbolic of perfection. Sard is an orange-brown or red-brown variety of chalcedony, sometimes referred to as brown carnelian. 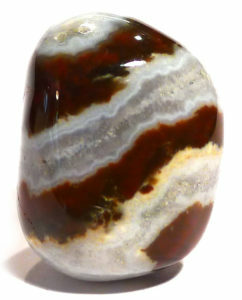 In sardonyx, this is be layered with onyx of black, white, or sometimes other colours. Sardonyx was a popular mineral for carving cameos, leaving a layer of white onyx on top of the ornament, and carving down into the sard layer for contrast.